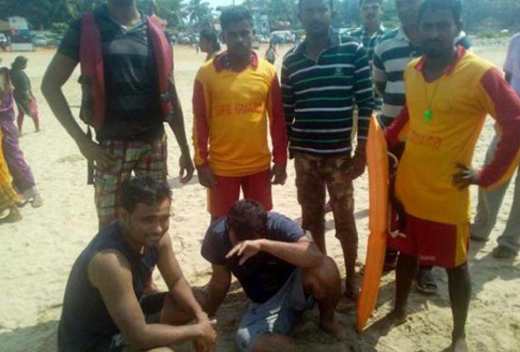 Karwar, Nov 11, 2017 : The lifeguards at the Gokarna beach in Uttara Kannada district on Saturday rescued two students who were drowning in the sea. A group of seven students from Bengaluru had come to Gokarna on a tour. They had ventured into the sea when two of them were washed away by high waves. Lifeguards Mohan Ambi, Raju Ambi, Chandrakath and Purushottam Harikanth rose to the occasion and saved the two from drowning. The rescued students are Ramesh Yadav of Uttar Pradesh and Kamalesh Kumar of Madhya Pradesh. Gokarna police have registered a case.